WE ARE MAKING PLANS to bring the Gift of Play to Site Soleil, an extremely impoverished community in Port-au-Prince, Haiti. According to Site Soley, the grass roots efforts of “a group of young artists and intellectuals” have led to the building of a new library, Konbit Bibliyotek Site Soley. 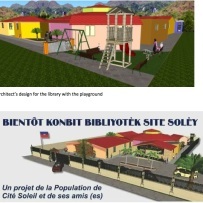 “This project is called Konbit Bibliyotek for a reason, because it leverages the principles behind the traditional Haitian practice of Konbit: if everyone contributes what they can, we can collectively achieve what no one could achieve alone.” We are thrilled to have the opportunity to donate a playground at the site of their new library.